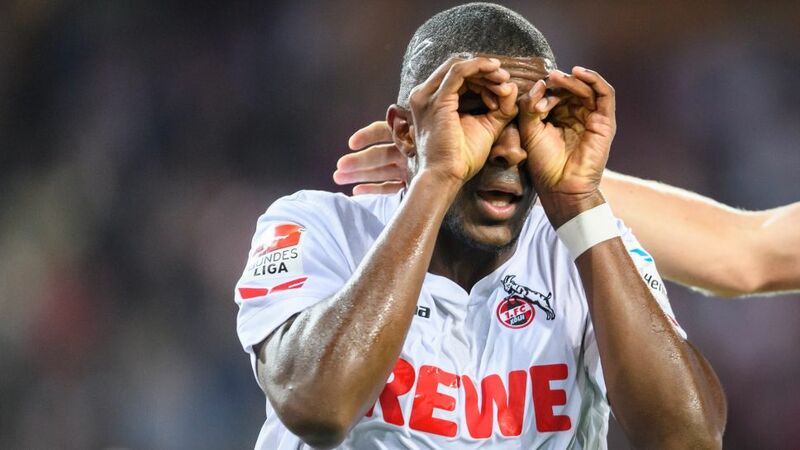 Take a closer look - there's more than meets the eye to the current top scorer in Europe, Anthony Modeste. Anthony Modeste is enjoying his most prolific season to date. The Frenchman’s celebratory “goggles” have been seen at grounds up and down the Bundesliga this term, but what lies behind them? bundesliga.com brings you 10 things you might not have known about the 1. FC Köln goal-getter's journey to the top. Still waiting to pick Modeste in your Fantasy team? Do not delay! Sign him up here and now! Modeste's family originate from the island of Martinique, but he was born in Cannes, on the French Côte d'Azur. His father Guy was also a professional footballer, although he was a defender by trade. Modeste senior played just one game in Ligue 1 for AS Saint-Etienne, ending a career that also included many years with AS Cannes and Fréjus. Fréjus is the club where Anthony was introduced to the game, near to his Cannes roots. It was not long before his name was echoing along the Côte d'Azur, though, and he signed a first professional contract with OGC Nice in 2007, aged 19. Just a few weeks after signing his first professional contract, Modeste debuted in the first team and went on to play 20 times for Nice, scoring just the one goal – a remarkable 35-yard strike against Rennes. Nevertheless, he worked his way up the youth ranks and debuted as a France under-21 international in 2008, scoring an impressive six times in 16 appearances at that level. Modeste had a rather nomadic start to his career, spending spells out on loan at SCO Angers, for whom he scored 20 goals and finished behind current France international Olivier Giroud as the Ligue 2 top goalscorer, and then Girondins de Bordeaux, who signed him for the 2010/11 season. Modeste moved on to Bastia for the following season and helped the promoted side to 12th place in Ligue 1 with 15 goals in 36 games, more than a quarter of the Corsican club's goals that season. He then made the move to the Bundesliga in 2013 and scored five goals in his first six appearances for TSG 1899 Hoffenheim, ending the campaign with 14 strikes as part of the team who scored fewer goals only than FC Bayern München and Borussia Dortmund that term. He continued a trend of hitting the ground running upon arriving at new clubs with a hat-trick for Köln in their DFB Cup first round win, going on to score 15 league goals for the Billy Goats (a record for a French player in a single Bundesliga season) and placing him fifth in the league scoring charts in 2015/16. Modeste's prolific form for Köln could allow him to fulfill at least one of those ambitions in the near future, with several French football fans calling for his inclusion in the national team set-up. SoFoot, a French football blog, were one of the first to promote the #Modeste2018 hashtag on social media, but it's a campaign that is gaining traction with every passing week. Watch: Who came out on top of Köln's FIFA challenge? Behind Franck Ribery (71), he is the second most prolific French player in Bundesliga history – ahead of another man born in Cannes, Johan Micoud, who scored 31 in Germany's top flight – and like his compatriot, he has a key entertainer's role in the dressing room, where he is the club DJ. Head right this way for more 1. FC Köln club news!